It’s our final post of the series! If you haven’t already, be sure to read our first, second, third and fourth posts post in the series for more tips. It’s important to get to know your clients, particularly their communication styles. 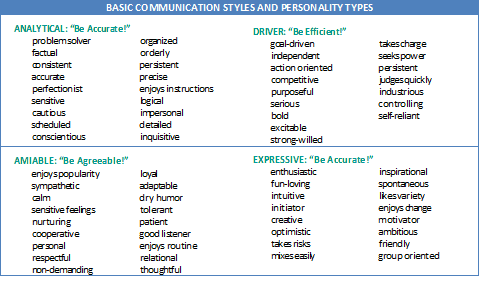 There are four basic styles: analytical, driver, amiable, and expressive. Use the table to profile your clients’ primary and secondary styles of communicating – and profile yourself. This will go a long way toward being able to better manage client expectations and promote good communication. It will also allow you to flex your own style and method to make the client feel comfortable and help both of you foster a deeper, mutually beneficial relationship. If you have any feedback on this series, be sure to leave us a comment or send us an email. And, don’t hesitate to reach out if we can be of any assistance to you or your business!